A bed is the most important furniture in a house. A comfortable bed with a suitable mattress will ensure that we have enough sleep and sufficient relaxation. Besides bedding, some pre-bed habits also help to relax our body and rest our mind. For instance, some people like to listen to music, do some reading, watch movies, etc. These pre-bed activities help in mind relaxation. In consideration of these factors, an American diversified manufacturer, Leggett & Platt, has surprised many users with its Starry Night Sleep – a high technology bed – in the recent International Consumer Electronics Show. What’s so great about Starry Night Sleep? Well, this bed features a lot of electronics gadgets such as iPod surround sound speaker system, LCD projector, dual temperature controls and DVR capability. The high-tech bed is also ready with wireless internet connectivity which allows you to do net browsing before bed. Besides, the Starry Night Sleep bed also comes with a vibration-detection feature. As we are aware, snoring is the vibration of the respiratory structure and its resulting sound. This is due to obstructed air movement during breathing while sleeping. This amazing bed can be elevated on one half to seven degrees in the event the user is snoring and then return him to the original position once the snoring stops. By adjusting the sleeping position, the respiration blockage will be reduced. It could be the solution to snoring problems and relationship problems. With such unique features, the invention does not come cheap. It costs around US$20,000 to US$50,000 and will only be available in the first half of 2009. If you can afford it, sleep can be bought after all. We can have more than just breakfast in bed. 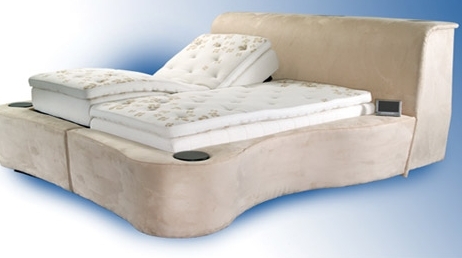 But this new luxury bed may also make people lazy and aggravate obesity problems in society.